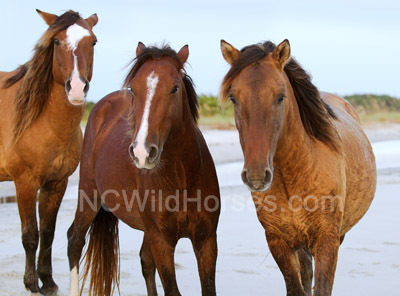 The wild horses of North Carolina's Outer Banks once roamed freely along the entire length of this coastal barrier island chain, isolated from man for the most part for nearly 400 years. Descended from Spanish mustangs brought by the earliest European explorers to the Carolina coast, they have tenaciously survived this harsh and unforgiving environment. By the early 20th century the popularity of this rugged landscape as a vacation mecca had taken over much of the prime Outer Banks land. Eventually the National Park Service took control over most of what was left, pushing the wild mustangs into more isolated havens. Now there are but three groups of these intriguing horses left. There is a fourth group which started from Shackleford and Ocracoke stock. Though now considered "feral" because of mixed bloodlines with some thoroughbred stock, they still clearly carry the tenacious traits of their wild Spanish Mustang roots. are right here in this informative FAQ.